The Deep River Boys, a singing group from Addiewell in the 1950s. Back (L-R): Andrew Cosgrove, Hugh McKenna. 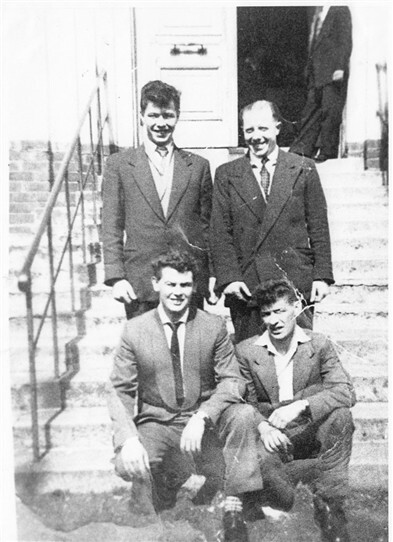 Front (l-R): Pat Smith and John Crossan. John Kelly. All rights reserved. S1. 142. This page was added by Sybil Cavanagh on 10/10/2012. I have been waiting to see when this singing group would get a mention and they certainly are worth a mention. Lovely voices each one of them and great entertainers- loved listening to them. Love this photo so much - my Dad is Andrew Cosgrove and my Godfather is Pat Smith.